Aluminum-doped zinc oxide (AZO) films were deposited on p-type GaAs substrates with different Al% via spray pyrolysis to investigate the dependence of terahertz (THz) emission on the interface electric field of AZO/p-GaAs heterostructures. Photoreflectance spectroscopy was used to measure the electric field at the interface of the heterojunctions. Reflection-geometry THz time-domain spectroscopy showed that the THz intensity gradually increases with Al doping and peaks at 2% Al, which coincides with the maximum electric field. Comparison of THz intensity and electric field confirms that the THz emission in AZO/p-GaAs is governed by photocarrier drift. In addition, it was shown that photocarrier drift is a dominant factor in the observed THz intensity enhancement. E. J. C. Solibet, A. Escaro, L. Lopez, A. Faustino, H. Rillera, N. I. Cabello, A. De Los Reyes, E. Estacio, A. Somintac, and A. Salvador. 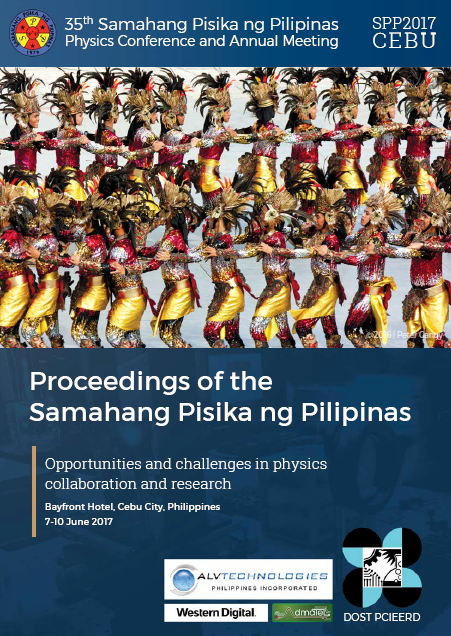 Investigation on the interface electric field of aluminum-doped zinc oxide/p-type gallium arsenide (AZO/p-GaAs) heterojunctions for terahertz emission applications, Proceedings of the Samahang Pisika ng Pilipinas 35, SPP-2017-PA-06 (2017). URL: https://paperview.spp-online.org/proceedings/article/view/227.